Last week, when Samsung announced its Galaxy S10 flagship phone series and started taking pre-orders for it, the company said that the new family of Android handsets would be released on March 8. As it turns out, that's true only for some S10 models, because others will not be available on that day in the US (and we're not talking about the Galaxy S10 5G here, which can't be pre-ordered yet). 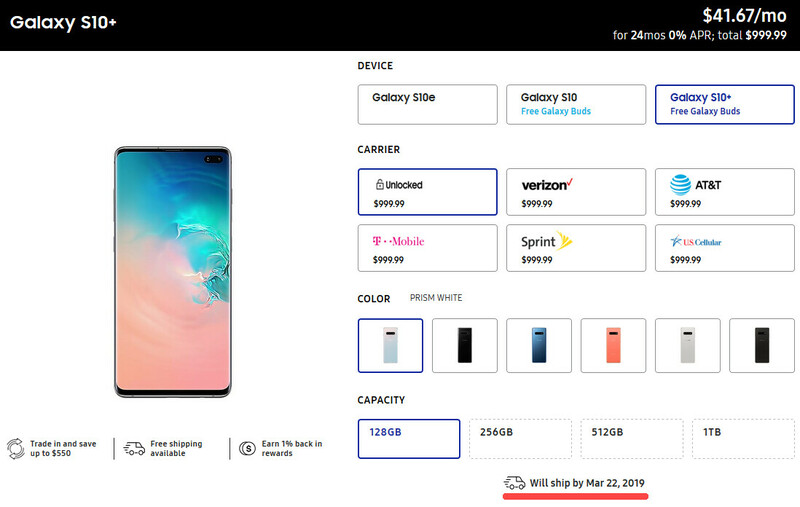 At the moment, Samsung's official US website says that both the unlocked and carrier versions of the Galaxy S10 128 GB (priced at $899) and Galaxy S10+ 128 GB ($999) will ship either by March 15, or by March 22 - depending on which color you are choosing (Prism White, Prism Black, Prism Blue, or Flamingo Pink). 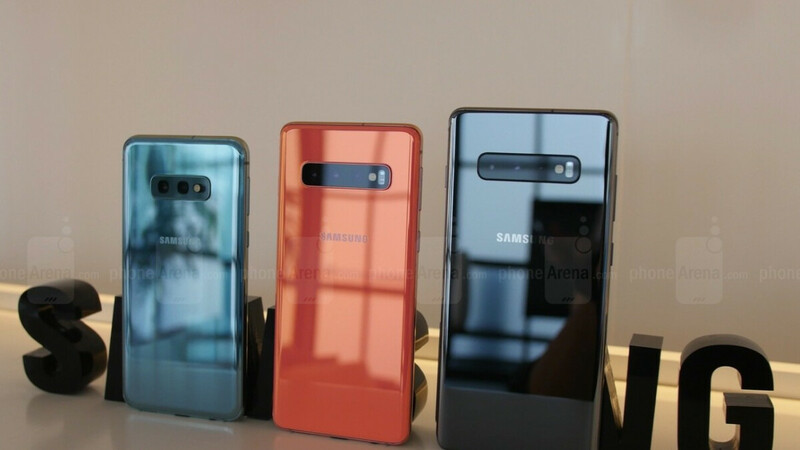 Knowing this, we think it's highly likely that these particular S10 models will be hard to find in stores in the first half of March - unless Samsung swiftly ramps up production. Meanwhile, it looks like there will be no delays when it comes to the Galaxy S10 512 GB, Galaxy S10+ 512 GB, Galaxy S10+ 1 TB, and the more affordable Galaxy S10e, as all these (regardless of color) are expected to ship on time - by March 8. As a reminder, if you pre-order any Samsung Galaxy S10 or S10+ smartphone by March 7 you will receive a pair of Galaxy Buds wireless earphones - a $129 value - for free. The Galaxy S10e, unfortunately, does not come with this perk (or any other, for that matter). Prices for Samsung's new flagship phones start at $749 (Galaxy S10e 128 GB) and go up to an unprecedented $1,599 (Galaxy S10+ 1 TB with 12 GB of RAM). Do you plan to purchase any of these Galaxy handsets? Or maybe you've already pre-ordered one? Tell us in the comments section below! Is it the same in Canada? S10e looks great to me, I think I will go for it but only after the first reviews on battery life. Tired of huge phones. Tests coming in show the S10's having an awesome battery life. Take a look at MrWhosTheBoss Video for example. Ditto to your entire comment! BGR did a review and wow..... What a great review. They normally go iphone crazy but not this time. It is the first time they praised screen battery and performance out of the box. I can't wait to see the note 10. They boasts 24 hours of battery life for the S10. Just pre-ordered a Prism White S10 128GB this morning via BestBuy. Didn't say anything about being delayed or "out of stock". I ordered the S10e and the S10 with Best buy as well. I hope no delays! My prism white 128gb S10+ pre-order via Samsung still says by the 8th... Let's hope it stays that way. Where are all the comments about Samsung deliberately restricting supply to increase hype like we’d get on an article about Apple shipping dates slipping? I reserved and pre-ordered the S10 in white prims and it says will ship by March 8. I did since first day. So I guess you are referring to the people bought after that. Two o Three days later I saw the information you are showing above it. Galaxy S10e, S10 and S10 Plus started shipping 25th of February here. I ordered The Galaxy S10 prism white.. Samsung told me it would ship by the 22nd of March, Into expect the headphones in the middle of April. Was a really great deal for presale. 550 credit for the Galaxy S9 trade in, $50 back accessory credit, And a free pair of Galaxy wireless earbuds. Total cost under 380 Dollars.